Ancient Stones - Borders - 057 Stone, Dreva Craig, Broughton. 057 Stone, Dreva Craig, Broughton. This single wedge-shaped boulder stands alone in the field to the north west of the hill fort on Dreva Craig and measures over 1.00m high x 1.10m wide and 1.60m long. The top of the stone is well fissured and also slopes at an slight angle. It's purpose is unknown but it is likely to have been left as a rubbing stone for livestock, as the churned up ground about it tends to suggest. 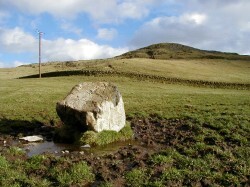 The stone is of the same type found around Dreva Craig but lacks any lichen growth, possibly due to cattle rubbing or licking the stone. From the A701 Penicuik to Broughton road, turn right at Broughton onto minor road leading to Dreva and Stobo. Follow the road until adjacent to Dreva Craig. The stone can be seen in the field to the north west of the hill fort. There is space for 2 or 3 cars beside the field access gate leading to Dreva Craig. At every site I visit, I always make a habit of scanning the surrounding countryside to see if there are any other interesting or potential stones worth recording. From the fort on Dreva Craig near Broughton, such a stone was obvious, even without the aid of binoculars. This stone stands alone in a large field devoid of any others and one question comes to mind, why is it still there when all other boulders have been removed through field clearance? Although old maps of the area do not record anything which might otherwise indicate some antiquity, there must be some reason why this stone remains. Is it just a rubbing stone left by the farmer for his livestock or perhaps a stone with some past ritual significance now long forgotten? It does also seem to be of a different colour and type to other stones near the fort. Is this significant? A friend pointed out that the grooves on the upper surface might have been caused by the knife used for ritual sacrifice. This cannot be true, can it? 001 Altar Stone, Stobo, Peebles. 035 Standing Stone, Drumelzier, Broughton.